Pentimento: a visible trace of an earlier painting beneath a layer or layers of paint on a canvas, (from Italian, literally ‘repentance’)…the artist ‘repented’ and created something new. 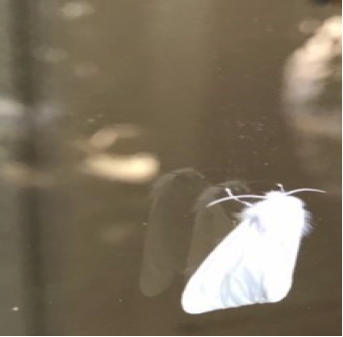 Recently, Jan, my friend and Partner in the gallery Art on 12, texted me that while she had been working at the gallery, a dazzling white moth had been hanging around all day… trying to get in whenever she opened the door. When she left the gallery that evening she sent me this picture … the moth looking in the glass door of the gallery. The next day he/she was gone. Now, weeks later, there are a handful of white moths persistently lingering by the back door. There’s something in there they like. Years ago, I collected vintage cameras. I ended up with more than 100. Back then they were relatively cheap and easy to find in small town antique stores, junk shops and flea markets. A special bonus was when I found one that still had film in it. I had a homemade darkroom in a spare bathroom at my house, and I was able to develop the old black and white film. Most of the time the film was ruined – aged beyond saving. Occasionally though, I would find composed shots of what looked like family vacations and other gatherings. Other times there were just ghostly images. Who were these people? Where were they, and what were they doing? After my Dad died and I was going through his belongings, I found a box of old photographs, obviously taken when he was a youngster. I never knew that he had taken photographs or even that he had owned a camera. But these were not run-of-the-mill landscapes or pictures of the family. They were obviously posed (by him) – set-up scenes that portrayed some drama: elaborate fight scenes starring his friends; costumed theatrical stagings that he invented; furtive ‘spy’ pics, (probably of the neighbors), with the vantage point of the camera from behind a bush or a tree. He had an artistic flair and a far more interesting childhood than he ever told me about. These days, one of my major interests in art extends to collage and assemblage work… something new fashioned from old, discarded or unrelated objects and pieces of things: Joe Hammer’s amazing collages made from cut-up book covers and papers; Ronnie Weeks’ elaborate and stunning assemblages from architectural salvage and vintage metal pieces; Jerry Seagle’s mixed media work incorporating paint, drawing, old postcards, photographs and writing. ‘Barely visible traces’… just below the surface… are everywhere in the art world… if you take the time to look.